Tag line: "Bit by bit..By bit he carved a nightmare!" While producer Tony DiDeo was thumbing through his newspaper one morning, he noticed an ad announcing that 1974’s The Texas Chain Saw Massacre was returning to local theaters for a short run. At first, he thought this was a bit odd; why show a movie that’s several years old? But after making a phone call or two, Tony discovered that, especially at this point in the late ‘70s, horror was all the rage, and meant big bucks at the box office. So, he rented his own copy of The Texas Chain Saw Massacre, got a few people together (including director Dennis Donnelly), and, while screening the movie for them, instructed the group to come up with a similar idea they could then turn into a feature film. From that, The Toolbox Murders was born. A shockingly violent motion picture that made its way onto the UK’s “Video Nasties” list of the 1980s, The Toolbox Murders is both an early slasher and a psychological thriller, and is not for the faint of heart. Over the past two nights, a string of grisly murders have occurred at an apartment complex owned and operated by Vance Kingsley (Cameron Mitchell). The victims, each a pretty young woman, were slaughtered with everyday tools, from drills to screwdrivers, making it difficult for Police Detective Jamison (Tim Donnelly) to track down the killer. The authorities are further baffled by the kidnapping of 15-year-old Laurie Ballard (Pamelyn Ferdin), also a resident of the complex, and wonder if her abduction is somehow related to the murders. In an effort to find his younger sister, Joey Ballard (Nicolas Beauvy) teams up with the owner’s nephew, Kent Kingsley (Wesley Eure, who played Will in the ‘70s Krofft show Land of the Lost), in the hopes they’ll uncover a few clues. What they find will shake them to their core. 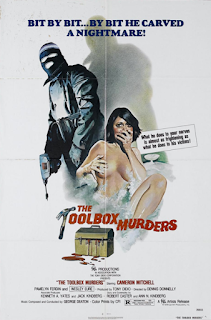 Following a brief opening sequence (which also features a flashback to a fatal car accident), The Toolbox Murders gets right down to business, with the killer (his face hidden behind a mask) finishing off a drunken Miss Andrews (Faith McSwain) with a hand drill, then heading down the hall to stop in on her neighbor, Debbie (Marciee Drake), who, after being knocked unconscious, has an unfortunate run-in with the claw end of a hammer. There will be several other victims as well, each killed in a fashion equally as brutal. The moment Laurie Ballard is kidnapped, however, The Toolbox Murders changes gears, becoming a psychological thriller (we learn the identity of the killer early on in the second half of the movie, thus solving the central mystery of the first), and while the violence is more sporadic later on, what little there is of it is just as gruesome as what went before. In a way, The Toolbox Murders is two movies wrapped into one, and while I think the first half of the film (the “slasher” portion) is better than the second, all of its various elements blend together nicely, combining its dual personalities into a satisfying whole.